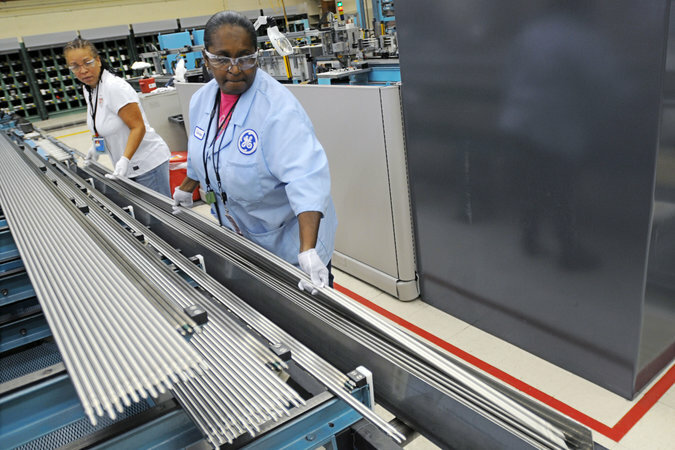 WASHINGTON — American manufacturing activity hit its highest point in nearly three and a half years last month and construction spending rebounded strongly in July, providing further signs that the economy entered the third quarter on strong footing. The upbeat data, released on Tuesday, added to reports on employment and housing that have suggested growth remains sturdy, despite a slowdown in consumer spending in recent months. "Things continue to fall into place for our view that growth should accelerate in the year's back half," said Dan Greenhaus, chief strategist at BTIG, an institutional brokerage firm. The Institute for Supply Management said its index of national factory activity rose to 59 last month, the highest reading since March 2011, from 57.1 in July. A reading above 50 indicates expansion in the manufacturing sector. Economists had expected a pullback to 56.8. August's reading was lifted by a surge in a gauge of new orders, which touched its highest level 10 years. Order backlogs and new export orders also rose. Total construction spending at a seasonally adjusted annual rate. American manufacturers fared better in August than factories in Europe and Asia, which have been hurt more by escalating tensions between Ukraine and Russia and a patchy recovery in China. The new-orders index correlates closely with quarterly changes in gross domestic product. Carl Riccadonna, a senior economist at Deutsche Bank, said the current level of new orders had historically been consistent with an annualized G.D.P. growth pace of 4.4 percent. Manufacturers were mostly upbeat in August, with business conditions described as improving, good, strong and robust. The bullish manufacturing picture was corroborated by another factory survey. The financial data firm Markit said its manufacturing purchasing managers index rose to 57.9, the highest level since April 2010, from 55.8 in July. The bright growth picture was underscored by a report from the Commerce Department that showed construction spending increased 1.8 percent in July to its highest point in five and a half years. This was the largest monthly gain since May 2012. In addition, construction outlays for May and June were revised up, which left some economists expecting the government to raise its second-quarter G.D.P. estimate by two-tenths of a percentage point to a 4.4 percent rate later this month. Third-quarter growth estimates range as high as a 3.5 percent pace, and some economists say the run of relatively strong economic data, if sustained, could prompt an early interest rate increase from the Federal Reserve. "We think that there will be a shift in forward guidance at the September policy meeting to a more neutral posture that would allow for a rate hike early in 2015," said John Ryding, chief economist at RDQ Economics. Construction spending in July was buoyed by a 3.4 percent increase in outlays for state and local government projects. That offset a 1.1 percent drop in spending by the federal government.